Objects Of Affection: We're Back! 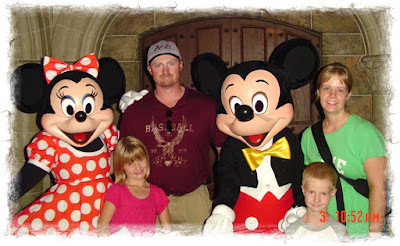 Oh goodness...we had such a great time in Disney World! We got to meet Mickey, Minnie, Donald Duck, Daisy, Snow White, Dopey, Goofy, Pluto, Mary Poppins and Cinderella! When we got there on the first day we went straight to the Magic Kingdom and got busy riding rides and meeting with many of the characters! We stayed until the park closed at 2 a.m.! I was amazed at how much walking we did, and the kids were such troopers, they walked every step with us (no strollers needed)! All of the adults (Me, Clint, my mom Beth and step dad Monty) all got blisters on our feet, but we pushed on each day! I hope to share more stories and pictures of our trip in the coming days...so stay tuned! Glad you had fun. Don't you feel like you need a relaxing vacation now? We always returned from Disney World pretty wiped out. That looks like such a great time! I'm jealous. ;-) I looooove Disney!